Sometimes, in the period between end of avian nesting season and beginning of migration I sit alone in the Garden and contemplate great thoughts. These are dark moonless nights filled with phantasm that all have seen but few are bold to talk of them. Who amongst us has not seen these phantasms? Their eyes glow back at us, reflecting an alien green, satanic red, reptilian yellow. A play on words drifts through my mind---more fanciful than real: night, light, sight, fright, flight. Here in the woods of Mary Help of Christians, northern Broward County the dark is deep, black, and almost quiet. After the eyes have become accustomed to the new shape of things, forest objects become not fearsome but curiosities. Curiosities in turn become realities, especially after we have accepted a sort of magical metamorphosis. Here there are griffins. Over there stand triffids and somewhere out there beyond the catch of light from my small flickering fire there surely must be druids, trolls, and perhaps even a leprechaun . And over there…what? Formless shadows that twist and flicker and blend into objects that magically become bushes, tree stumps, rocky grottoes. What sorcery is this that changes grasping claws into patient dark fronds of fern? These dark woods have a wild and enchanted aspect and a history that dates back hundreds of years. Grandmother cypress stands regally in the midst of the woods and at 120 years of age is yet a child in the ranks of cypress trees. The parish celebrates some 25 years on site this September. That, in cypress tree terms, is as nothing. To say the forest and prairie are quiet is not, however, to say that they are completely silent. The darkness in these woods carries a different kind of silence. It is the quiet of midnight dew dripping from moon-polished trees sounding non-synchronized “thaps” as the tiny drops strike the woodsy detritus; the whispering of tiny feet among the leaf paper on the path; the sibilant sign of something long and unseen hurrying away from your footsteps; or a spectral aerial wraith that flits from treetop to treetop just out of reach of moonlight, sight, and acceptance. I have come to accept that squirrels are quite active at night. The quietness in these woods is a symphony of perfect solitude, the acceptance of the soul finally conversant with itself. And at night, when the church is locked for safety and security, these woods are as a forty-hour devotion of a different kind. Separate in time and space from the mighty European Cathedrals or diocesan churches but nevertheless one with God. Sitting in these woods is a peace and a stillness. It is a resignation of sorts, shared with all of Nature, while remaining one and alone in the presence of the Great Unknown. There is one pervasive sound throughout all the darkness of Hoechoka Hammock that is rarely, if ever, heard in the city. That sound is the stillness of the universe behind the scratching rainfall of crickets. Of all the creatures of the night, I suspect that crickets are the most familiar. A night of dead blackness and silence loses all its terror when the sound of crickets is laid over it. I think that if Man ever leaps off this planet and runs away on sleep-long journeys to the stars, he will not remain sane awakening in that ultimate night without the pervasive sound of crickets. I truly wonder whether dying might be more peaceable if we could only hear the crickets and listen to their gentle, insistent chirring lullaby as we sink into that final slumber? Peace, good night, and sleep now. The requiem is from the singers of Hoechoka Hammock. Saint Augustine had a respect for the diversity of God's creatures. According to him, other creatures do not exist solely to serve humans but rather to glorify God. "Heretics," he says in his writing "The City of God, "…do not consider how admirable these things are in their own places, how excellent in their own natures, how beautifully adjusted to the rest of creation, and how much grace they contribute to the universe by their own contributions, as to a commonwealth". We have come to call this posture ecology, land stewardship, and a multitude of other terms that the modern person exalts as some recently discovered truth. However, St. Augustine got there first and was followed by St. Francis and a multitude of others up to and past Rachael Carson, Ernest Thompson Seton, and our very own Floridian, Marjory Stoneman Douglas. All these, and many more both Theocentric and just aesthetic converge on a singularity — nature is diverse and totally unknowable fully in its complexity and depth. We have a small universe here at Mary Help of Christians. It is a mere twenty-four acres which in the order of things is not all that much. But it is a healthy challenge to the Land Stewardship Committee (LSC) and the cadre of volunteers. For one score and five years the LSC has walked among the diversity of this land and, as of yet, can not count the numbers nor fully understand the interrelationship of the species both flora and fauna. We think there are one hundred and twenty-one species of native plants, slightly more than two-hundred fifty thousand plants, six species of mammals, ten species of fish, five of turtles, three of snakes, and about seventy five species of birds coming and going. We think. But, we can't be certain. It is a fool's game, this counting. Time is better spent in prayer. But than, maybe counting the blessings of the Lord is prayer. In truth we have learned that how "admirable these things are in their own places, how excellent in their own natures, how beautifully adjusted to the rest of creation, and how much grace they contribute to the universe by their own contributions, as to a commonwealth". To say the forest and prairie is quiet is not, however, to say that it is completely silent. And the darkness in the country carries a different kind of silence. It is the quiet of midnight dew dripping from moon-polished trees; the whispering of tiny feet among the leaf paper on the path; the sibilant sign of something long and unseen hurrying away from your footsteps; or a spectral aerial wraith that flits from treetop to treetop just out of reach of moonlight, sight, and acceptance. This quietness is that symphony of perfect solitude, the acceptance of the soul finally conversant with itself. It is the peace and the empty black warmth of our own last night on earth. A stillness and a resignation of sorts, shared with all of Nature, while remaining One. And alone. 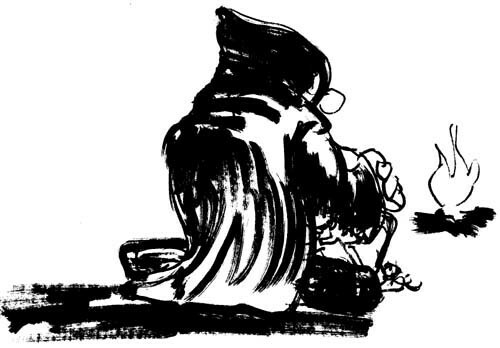 Just who is the figure in the habit with cloak sitting by the small fire musing on paradoxes, parable and paradigm? Is this meant to be the pastor or associates. Perhaps it’s the deacons or dedicated members of the various ministries that service Mary Help of Christians? Or, reverently spoken, the very presence of the Holy Spirit as presented to the eyes of man? Actually, it seems, it is all but not one. It is one but not all. And therein lies the paradox. Seems like playing with words, doesn't it? Well, why not? Lewis Carroll in his work Alice Through The Looking Glass (known to us as Walt Disney Alice In Wonderland) highlighted the game in the dialogue between Alice and Humpty Dumpty. "When I use a word,’ Humpty Dumpty said, in a rather scornful tone, "it means just what I choose it to mean, neither more nor less." "The question is,’ said Humpty Dumpty, ‘which is to be master – that’s all." Many theologians and spiritual writers have for long associated the Wisdom literature of the Old Testament with what the present day Christian refers to as the "Holy Spirit"—formerly known to the elders in the Catholic community as the "Holy Ghost". John of the gospels opens his book with the reference that "In the beginning was the Word and the Word was with God and the Word was God……"
So, we have Holy Ghost, Holy Spirit, Wisdom, and the Word only referring to a part of the very nature of God who itself is inscrutable. And truly, if God is inscrutable how is one to ever fully and maybe even partially understand it or describe it. As humans we are relegated to using words. And that takes us back to Alice and Humpty. The question is which is to be master: the word or the user. So our little friend by the fire muses in his own way about Mary Help of Christians and the beautiful wooded area that surrounds it and in the process comes straight up against the paradoxes, the paradigms and the parables of the situation. How is it, for an instance, that the 24 acres of parish campus is heavily landscaped with 98% native vegetation? At the time of purchase the land was wasted, Utterly and totally ravaged with tell tale mounds of dirt under which laid burned over pine trees, cypress and mulberry cleverly hidden and slow burned in the manner of charcoal preparation so as not to draw attention to the scourging underway. The scourging of course to prepare the land for the hallowed shopping mall which is always the highest and best use of land in South Florida. But up comes the Archdiocese and sees amidst all the destruction and scrapping small slivers of green the promise of Nature not to be denied the relentless advance to return to the Cypress-maple-pine area that aerial photographs show it once was in the 1950's. "Can we build a parish here," the pastor asked of a small coterie of early parishioners. This group of dedicated volunteers with vision beyond the horizon could see all the makings of a church set in a wooded, verdant area showing the deep belief in the environment and the potential for a strong statement that this archdiocese, this parish, these people could take the lead in the environmental parade. And of their numbers, some have passed on, some have moved on, some are present and others have aged with nicks, scars, scratches and ailments that are the battle scars of the "good fight" to return this small section of Parkland back to near what it was before civilization came upon it. The paradigm became that "parish is not a place where…." but rather "a people who…". In the process of developing building, school, sacramental life the message of the beauty of God's creation slowly filtered its way into most every fabric of the pulse of the parish. Masses in the Garden for Thanksgiving, Christmas and Easter became common place. Baptism in the Garden were sought after by many and provided a cross reference back to the first baptism in a river called Jordan. The vary act of coming to Eucharist was a journey through wooded land developed to enhance not just the utility and beauty but the functionality of the land that supported a rich diversity of flora and fauna with ample supply of seeds, berries, and nuts for migratory and resident denizens in fall, winter, spring and summer. And now comes the paradox. The very act of building the parish has caused consternation to the neighbors who came 12 years late to the land but demanded yet more vegetation so that the sight of people worshipping and coming and going and the youth play of children will not bother them. They who could have had a shopping mall or barren sandy wasteland now insist that more vegetation be added. Many of them in fact want to help out with the project. It seems the view from the back porch is pleasant. And the property values have indeed increased. How about that? The parish in helping itself, helps the neighborhood that insists on the church helping itself some more so that that they can be helped more. And it is no accident that Parkland put its moniker TREE CITY USA adjacent to the parish grounds. on the topic of "Right Tree Right Place." In the end the city and most of the residents speak of landscape while here at Mary Help of Christians we speak of Land Stewardship. Landscape is not land stewardship but land stewardship is landscape. To seal the deal, parishioners are invited to become part of the wisdom of the process. It is simple enough—just put on the habit. Come and see. Sit by the fire.